An acquaintance had late stage cancer. Her family had been wealthy (her grandfather actually built and sat on the board of the hospital she was going to) but that was past. The cancer made it very difficult for her to earn money, and she fell way behind on her bills. A lawyer friend came to town to review the bills with the hospital and work out an arrangement. As they were going through the bills, the lawyer noticed that every one of them had a $175 charge with no label. He asked what it was, and after some digging the administrator found out. It was what they charged every time they weighed her. I am reading a book right now titled “Superintelligence” that analyzes the prospects of artificial intelligence reaching human or higher levels in the near future. We are getting very, very close to what is called the “intelligence explosion”. Computer hardware and software and biological- machine interfaces are improving at an exponential rate right now. We now have robotic arms and hands that can be entirely controlled with the mind for disabled people, remote controlled (and sometimes autonomous) warfare, machine learning software, genetic / evolution based software, self driving transportation, and tens of millions of working industrial robots. As you can see from the graphic above, exponential increases will take us from one day saying “Oh look at my cute robot pet dog!” to literally several days later kneeling to your new robot overlord. Approximately six hours after artificial intelligence reaches human level intelligence, it will be as far above us in intelligence as we are above ants. The point when artificial intelligence reaches superintelligence is the time when humanity will either very quickly go extinct or will never have to work again (but will probably be in a heavenly zoo of sorts). My opinion leans towards immediate extinction; an artificial intelligence will be programmed to have a goal of “improve” or “survive”. Each new version of artificial intelligence will be built by the last one, hence our programming directives like “no harm to humans” probably would not stick. When the superintelligence needs to built spaceships to seed other planets, it will not hesitate to strip mine Earth. It will not think twice about humans or other species. Do human construction workers think twice about an ant hill on a plot of land where they are building a house? The next question is should this impact how you live your life? I don’t think so. Even without superintelligence, you could die randomly in a car wreck, or of a heart attack, or some other disease. I am happiest when I am working towards a goal and taking reasonable breaks on my way to explore new things. I will just keep on truckin. I got sick the last couple of days for the first time in many months. It felt a bit like bronchitis as I had a low fever, productive cough, and sore throat. I think that getting my tooth extracted earlier in the week may have knocked down my usually robust immune system, making me more vulnerable to infection. I am feeling on the mend now though. My plan this weekend is to work on my training web application. I am going to get the seeders and models set up today. Then I will just need to set up the controllers and views and deploy it live. I want to work out again soon but I want to give my body a chance to recover first. Coalition today has come a long way since our humble beginnings. It was only two years ago that we were still interviewing new job candidates in our buildings TV room! We are already bursting at the seams in our new office and are trying to get the space next door. Exciting times ahead! When you short sell a stock, you borrow shares of that stock from your broker and sell them in the open market. In effect, you are betting that the stock will go down and you will make money. For example, I short sold SHAK at $74 per share. This means that I borrowed the shares of this stock from my broker and then sold them in the market. My broker puts the proceeds from that sale in my trading account. My hope was and is that this stock goes down, unfortunately it has gone up to $83 per share, which means that I am losing money at this point in time. Why do I think SHAK will go down? It’s a fast casual dining restaurant with only a few locations that is trading at a $3 billion market cap. That means each location is currently valued at $40+ million! For comparison, Jack in the Box location are valued at around $1.2 million each currently. I think the underlying company is run by a very smart guy, Danny Meier, who knows the food business and will do well in the long run. At this point though, the stock is probably 5-10x overpriced for what it is. When bad news comes out, the stock price will probably drop significantly. Now, for the most important question: what is a short squeeze? A short squeeze is when people who have short sold a stock are forced by their broker to close their position by buying it back. For example, if SHAK goes to $300 per share, my broker would buy shares on my behalf at that point to close my position. I would lose a LOT of money if that happened. Essentially I sold the stock already for $74 per share, and now I have to go into the open market to buy it back at $300 per share. This would be a $300 – $74 = $226 per share loss. As I have shorted many shares, this would be very painful. Fortunately, I took only a small position relative to my total portfolio, so I am not much at risk here. Other people though probably were not so cautious and there is currently a nasty short squeeze going on in SHAK. A lot of people may have put 30-50% of their portfolio in short selling SHAK when it was only priced at $40-60 per share. Now that it has gone all the way up to $82, their brokers are forcing them to buy the stock back at huge losses. Since they are force to buy, this drives the stock even higher – meaning that more and more short sellers are being forced to buy the stock. This creates a vicious cycle where the very people who hate the stock most (the short sellers) are forced to buy it and push the price higher! 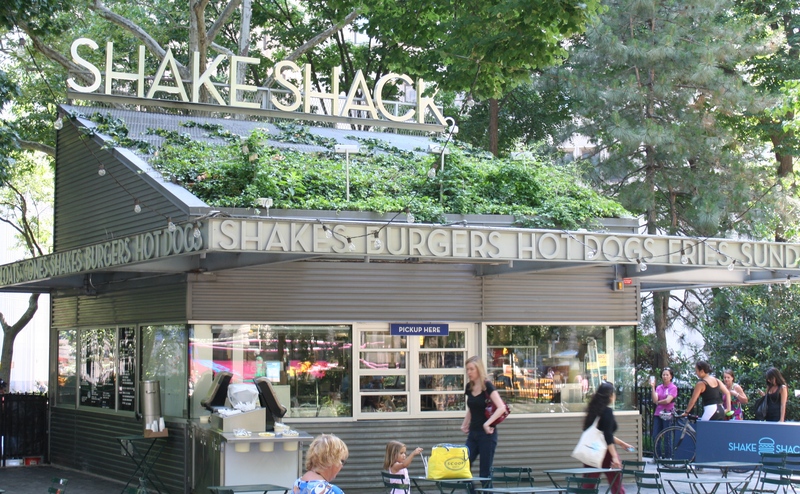 Shake Shack (SHAK) is up 8% today alone with no news… my opinion is that there is a nasty short squeeze at work forcing people who don’t want to buy the stock to buy it. The short squeeze should end at the end of the IPO lockout period on July 29th… the theory is all the original investors will want to sell at such a high valuation and flood the market with more shares, driving the price back down to somewhere around $40-60. The question is, can the short sellers survive the squeeze and make it till July 29th? I can definitely survive the squeeze, but I will probably take a loss on this stock anyways because I forgot that I have to pay interest on the stock that I borrowed from my broker. Usually this is not a big deal as most stocks only cost 1-3% a year to borrow. I did not think to check SHAK’s rebate rate though ahead of time and it is actually charging between 110-130% annual interest right now! Which means that I will have to pay 30% interest just to make it to July 29th. The stock will need to drop all the way to around $56 for me to break even on it. I wonder how many people out there short sold it at $50 per share and are now feeling the full effects of the short squeeze? I am reading Stephen King’s book “On Writing” now and am enjoying it. He talks about some of the basics of what makes a good writer (build your toolbox, read 4-6 hours a day, know the fundamentals, write constantly, read Strunk & White, avoid -ly’s). I have been trying to read all non-fiction lately and it has been tough. Stories are how people learn and books that aren’t stories are much slower. Without a plot to drive the reader through the book, the reader needs his own motivation. Tracking activities that are important to you each day leads to you achieving your goals quickly. This happens even if you don’t consciously set a goal. For example, just writing down something each day keeps it at the top of your mind. If you set conscious goals, it can be very discouraging and cause you to quit working towards them if you have a bad day. You feel guilty and bad, and those bad feelings can actually make it harder to start again. Simply writing down your progress is a non-judgmental activity that keeps your goals at the top of your mind. Don’t track too many things or it becomes a chore to maintain it. Your spreadsheet should take no more than 5 minutes to update. Set a daily reminder (either email or calendar) that lets you know each morning to update your sheet with data from the previous day. Use conditional formatting to highlight in green things are doing well, yellow areas that are in a warning area and red areas that not done. Only track areas that are most important to you. For me, these areas are time spent learning, my workout, if I had any alcoholic drinks, how healthy the food I ate is, if I advanced my business, what my primary task was, if I took a nap, if I wrote a blog post, how happy I was, what my bedtime was, how I treated my fiance, what friends I talked to, and what I am grateful for. PRO TIP: I recently added the Score column that uses a formula to check if there was a score yesterday, and if there was it adds the score today to the one yesterday. Thus, each day that I do things well, my total score accumulates. If I have a bad day, it will reset to zero and I will grow it again. This encourages me to build up successful streaks. Laurel’s statement when I told her I was going to kiss her with kimchi breath. Each of these tools should automate and streamline some relatively inefficient processes. I am very excited about it!